Home Daily Infographic	The Coffee Conundrum: To Drink Or Not To Drink? The Coffee Conundrum: To Drink Or Not To Drink? So, at last week’s FITNESS Magazine Meet & Tweet, I attended a panel discussion titled “The Real Deal on Carbs, Cleanses and Caffeine.” Believe it or not, the crowd was kind of sparse – I feel like people were far more interested in the swag than the dialogue – but y’all know me. I’m nerdly… and I don’t turn down the opportunity to gather more info for BGG2WL. Considering how they had June DeMelo, FITNESS magazine’s nutrition editor; as well as Keri Gans, RD and author of The Small Change Diet (grrr, there’s that word again); and Tanya Zuckerbrot, RD and author of The Miracle Carb Diet (…and again…), I figured there’d be some valuable information worthy of sharing, here. I separated out the portion on coffee because I think its worthy of its own separate post, since so many people ask me about it. I feel like, far too little, people differentiate between “coffee” and “instant” coffee, coffee that you brew yourself and “coffee” that you get from certain places, or are even unwilling to say “a little coffee” vs the “all or nothing” approach. Considering what I knew about coffee before I attended, I was glad to see some of what I knew to be confirmed…but lots of things weren’t touched. Coffee, it seems, is one of those things people either go for or don’t really care for, and I’m totally fine with that. That being said, all coffee is not created equal. There’s a reason why, even though there’s “instant” “coffee” (it dissolves in your cup!…?!??) there’s still a “brew your own at home” market. And, even though there are brands that are out here with catchy commercials and epic marketing, there’s still a market for people who like to have their beans ground right in front of them. There’s a reason why, for all of that. 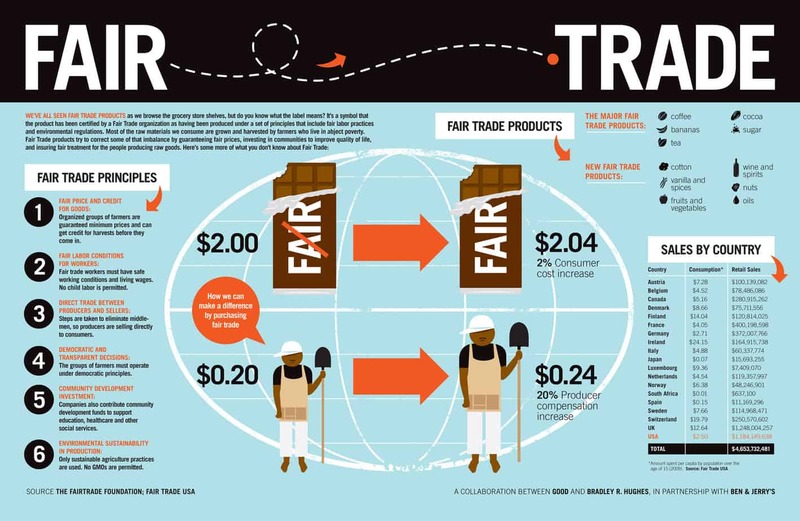 I think the infographic above, courtesy of Good.is, covers fair trade and its importance pretty thoroughly. There’s easily another thousand words I could throw in here about this, but I’ll save that for another day. Suffice it to say, when things come too cheaply, someone’s getting shortchanged in the end… and it’s usually the person with the fewest representatives and the smallest “voice” (read: least money.) You want to consume consciously not only for your health, but for the sustainability of our communities (yes, even the global community, as well). As with all other things, the more manipulated it is by man, the less the benefit you can receive when it comes time to consume it. So instant coffee… that’s out. Nothing should be dissolving into your drink and creating “awesomey goodness.” That’s the height of hyper-processed food trickery. If it dissolves… it’s gotta go. Processed coffees with branding, labels and other fancy schmanciness… let’s just say this. If you have a spot in your coffee section that allows you to portion out your own beans and grind them, then you should do that.The less the processing, the more of those antioxidants you’ll be receiving from your cup. There are different flavors available – they’re made in almost every way between “pouring ‘natural flavors’ on your beans” to “roasting the beans with fruits to give their flavor” – and often times, the flavors are good enough where you neither want nor need all the sugar and cream and goodness knows what else in your coffee. You can also add flavors to your own beans and roast them yourself. There are lots of coffee shops who will do that for you, as well. That leads me to another point, that one of the RDs made above. What are you putting in your coffee? If it’s some form of artificial sweetener… let’s talk. Are you using raw sugar? Actual raw sugar? Unbleached? (No, not even those “bleached but coated in molasses after the fact” sugars will do.) Consider using something a little less…adulterated. And what about those creamers? If you’re using a certain creamer brand, you can rest assured it’s not clean. In fact, it has trans fats in it. If you’re using a non-dairy creamer, again… rest assured, it uses trans fats. 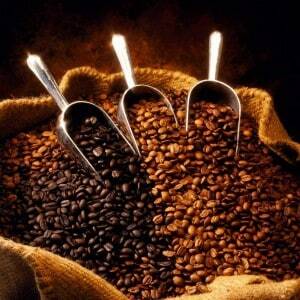 Coffee, though it may have antioxidants, is not essential enough to sacrifice “clean-liness” for it. If you’re in need of a pick-me-up that badly, a hearty piece of fruit does the job just as well as coffee… unless you’ve become addicted to it (which, considering how it has effects similar to other addictive substances, would make sense.) Try to stick with regular creamy substances to avoid the negative side effects of consuming mystery chemicals on a regular basis. Using creamer is, more often than not, a means of adding fat to the drink to make it more palpable – people can often be caught adding any member of the sugar/fat/salt trifecta to their food – so, I must say, coffee isn’t essential enough for the strife. As a “clean” coffee habit can get kind of pricey – fair trade, flavorful beans, raw cane sugar, clean creamers – it’s easy to see why someone would simply tap out. To drink, or not to drink… that is the question. That being said, I wish y’all could see the cup of coffee I have sitting beside me on my desk. Pardon me as I hug my island roast, complete with coconut milk. Swag my morning out. I do it the el cheapo way because, quite frankly, I’m cheap. I invested in a french press. I use, maybe, one tablespoon of coffee each morning in the bottom of my french press and boil two hearty cups. Sometimes I use something to make it creamy, sometimes I don’t. I don’t add sugar, but I also don’t swallow my cup whole. It’s coffee, not kool-aid. I also went to a coffee shop and paid outright for a full pound of coffee, ground especially for a french press. Because the press uses so much less coffee than a coffeemaker (and uses less electricity), I wind up saving money both ways. The pound of coffee has lasted me six weeks thus far, and I just got to the half-pound mark. So…tell me. How do you do your coffee? My comment has nothing to do with coffee. Dear Erika, Keri Gans use to be my dietitian she one of those people who fuel a bad relationship with food. She even scolded me about being vegetarian and eating anything coconut or mango but recommends pop chips instead. The lady did not want me eating any ital carribean foods and my family is from the islands. Many dietitians help hinder progress with their bad calculation or prejudices and lack of knowledge. The lady never heard of yucca or breadfruit. I switched to find I will not go back to any dietitians who are not culturally sensitive. Sorry for my rant. My question want is the best way to choose dietitian or nutritionist. Ahhh, yeah… she’s one of those who discourages eating fruit. That’s unfortunate. I love my cup of coffee or 2 a day, its just something I feel like I have to have. Even though I don’t add any sugar I do love myself some creamer! Powdered or liquid it doesn’t matter! I have tried using milk instead but it just doesn’t taste the same! I am trying to figure out a way to wean myself off of regular creamer and use something else but I just haven’t found anything that I like. Tomorrow I will be trying almond milk instead of creamer hope this goes well. Try unsweetened almond milk and add vanilla or cinnamon… any spice. Wow, this could not have come to my Facebook post at a more opportune moment. I’ll admit to being a novice to your site, having “liked” it months ago via a girlfriend, but never reading any of the articles. That being said, I’m a little like Maria from 9/18 and Karen from May. I love my coffee and it’s more about the ritual. My habit is a good old fashioned cup o’ joe from 7-11. Blueberry flavor with heavy cream and Splenda–the epitome of a morning dessert. Recently this week, I decided to readjust my coffee habit and cut the creamer to half-n-half and reduce thenumber of individual creamers. I’d never even given thought to all the alternatives you presented. Perhaps I will go out and look for a nice organic fruit-infused coffee. That way I won’t have to give it up altogether. I am very proud of the fact that I limit myself to one cup per day, and have been able to keep that habit. i drink one cup of coffee per day and if i dont i turn into the exorcist. I only drink coffee every now and then but I used to drink coffee with so much cream and sugar that one day someone asked me “Do you want coffee with that?” While I was doing a weight loss program I wanted to get my points as low as possible so I trained myself to drink coffee black. I was over a friends house and she made coffee using the French Press method and I really liked it so I am going to consider investing in one. I drink coffee (decafe only) however i use sugar free creamers, no sugar at all. coffee is my relaxer. So whats your take on sugar free creamers? Well, what makes it sugar-free?